IQOS 3 is here and it’s faster, tougher and better. IQOS 3 has a compact and ergonomic design with a newly designed pocket charger. It is enhanced with the new ProtectPlusTM system for improved reliability and protection. The IQOS 3 holder is slimmer – the smallest tobacco holder in our range – and you can drop it into the Pocket Charger more easily with the help of its new side opening and magnetic locking system. IQOS 3 also comes with a longer battery life and its holder is 15% faster to charge compared to 2.4 Plus. Available in your chosen colour. Specially designed brushes, one long and one short, for cleaning the IQOS Holder and cap. Gently remove tobacco residue from inside the Holder. Micro-USB cable to charge the IQOS Pocket Charger. Use with the micro-USB cable to charge the IQOS Pocket Charger from any electrical socket. The IQOS 3 has a compact and ergonomic design. It is enhanced with the new ProtectPlus™ system for improved reliability and protection of your device and a longer battery life. 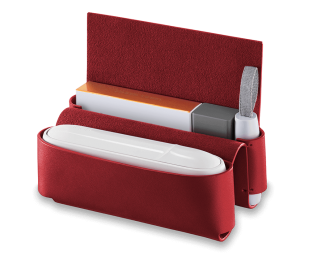 The IQOS 3 holder is a slimmer holder and fits into the Pocket Charger into the 'easy drop' side door with magnetic lock. IQOS 3.0 is also 15% faster to charge vs. IQOS 2.4 Plus.